Goals from David Villa and Alex Ring force Atlanta United and New York City FC to split the points. Atlanta United: Guzan; McCann, Parkhurst, Gonzalez Pirez; Garza, Nagbe, Kratz (Barco, min. 70), Gressel; Larentowicz; Almirón, Martínez. 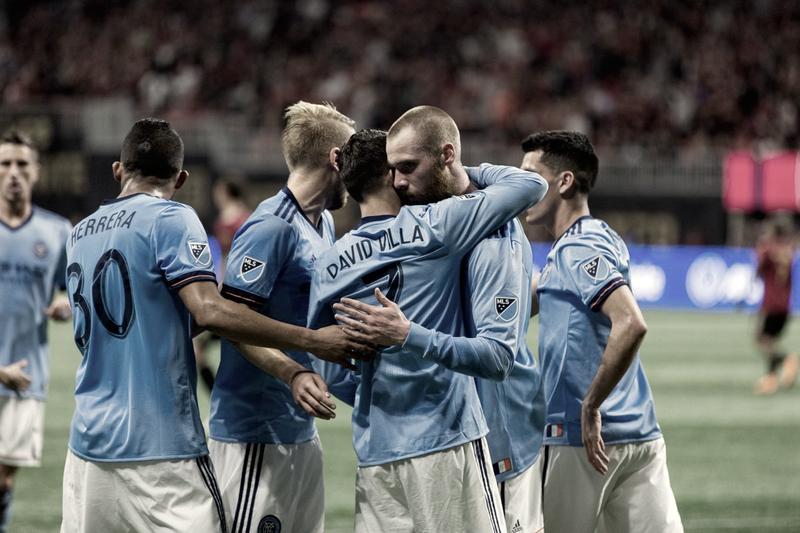 New York City FC: Johnson; Sweat, Callens, Chanot, Tinnerholm; Herrera, Ring, Moralez; Tajouri-Shradi (David Villa, min. 35), Berget (Wallace, min. 61), Medina (Matarrita, min. 85). SCORE: 1-0, min. 29, Garza. 1-1, min. 38, David Villa. 2-1, min. 56, McCann. 2-2, min. 73, Ring. On Sunday, MLS fans were treated to a battle featuring two of MLS' most exciting teams. 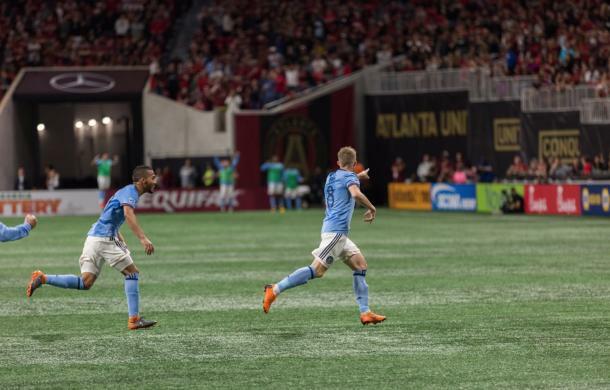 An unbeaten New York City FC took a trip down south to play Atlanta United in front of a loud Mercedes-Benz Stadium crowd. NYCFC had to do it without David Villa in the starting lineup though he made an early substitute appearance. Despite Hector Villalba's absence for ATL, Five Stripes fans were excited to finally see MLS' most expensive import make the 18-man squad for the first time. That player, of course, being Ezequiel Barco, eventually came on as a substitute for his MLS debut. The game started with a lot of excitement. No real chances until the 13th minute when Jo Inge Berget cut the ball onto his right foot and blasted a shot at Brad Guzan. The experienced goalkeeper made the save giving NYCFC their first corner kick of the match. Atlanta displayed good counter-attacking play straight after that with Miguel Almiron getting in behind. Luckily, Alex Ring caught up the #10 and ended the danger. Around the quarter of an hour mark was when NYCFC began to grow into the game a bit. Despite that, the next good chance came in the form of a free kick for Atlanta United in the 27th minute.A clever set-piece play saw the Jeff Larentowiz's go narrowly wide of the goal. A few moments later, in the 29th minute, Almiron continued to provide trouble for the NYCFC defense. Picking the ball up at around midfield on the left flank, Almiron saw his pass to Josef Martinez cut out by Alexander Callens. Almiron picked up the ball and cut it onto his left foot. His 20-year shot was stopped by Sean Johnson, but his rebound control was not good enough and Greg Garza pounced on it for the opener. The Boys in Blue also showed they were capable of counter-attacking football as well when Maxi Moralez lead the charge playing the ball into the path of Berget. The Norwegian darted into the box before cutting the ball onto his right foot resulted in being brought down by a recovering Michael Parkhurst. The penalty kick was awarded, and the recently introduced David Villa made no mistake from the spot giving his side the equalizer. That scoreline didn't last long as Atlanta regained the lead in the 41st minute. Darlington Nagbe's first in a Five Stripes kit.. or was it? Nagbe's goal was reviewed by VAR and after taking a look, Josef Martinez interfered with Sean Johnson and the goal was called back. The pair of teams went into the break tied at 1 goal apiece. The second half started similarly to the first with the game growing in intensity pretty fast. In the 57th minute, we saw a goal. After dominating most of the opening moments of the half, Chris McCann found the go-ahead goal. Almiron found the ball on the wing and chipped it into the middle finding a wide open McCann who put in his first career MLS goal. With 20 minutes left to play, MLS fans were treated to Ezequiel Barco. MLS' most expensive player came on just in time to see the opposition score a world-class equalizer. David Villa worked hard to get the ball to Alex Ring who lasered in a shot from about 20 yards out. Certainly a contender for Goal of the Week, Ring will always remember his first MLS goal. Atlanta pinned NYCFC in their half for most of the remainder of the game, but nothing came of it. One of the most exciting games in this young MLS season came to an end as a draw. NYCFC remain four points ahead of Atlanta in the Eastern Conference and their unbeaten start to the season continues. For NYCFC, they'll look to keep their unbeaten streak alive at Providence Park when they play the Portland Timbers a visit. Then, they'll return home to host FC Dallas before the first Hudson River Derby of the season vs the New York Red Bulls. Sunday's host will turn their attention to Zlatan Ibrahimovic and the LA Galaxy following Sunday's game. After their visit to Los Angeles, they'll host the Montreal Impact before going back on the road to face the Chicago Fire.